Well-Known Strangers is a pop-rock band that makes its home in Racine, Wisconsin. The band came together in 2014 when founder, chief songwriter, and guitarist Joe Adamek decided he wanted to create a band that contained female vocals and cello. The result of Adamek’s vision is a band that features some of the strongest musicians from that area’s music scene. Along with Adamek, the rest of the band consists of: Betsy Ade (vocals/songwriting), Roger Gower (drums), Sacia Jerome (cello), Jon Wolf (guitars), and John Kulas (bass guitar, guitars). Together, the band of Well-Known Strangers has just released a new EP entitled Found. The new release from Well-Known Strangers begins with the track “Aligned”. The track has a strong folk-rock feel to the music and also contains a driving feel to the music. The vocals from Betsy Ade bring to mind a cross between Sinead O’Connor and Enya. The music’s folk-rock sound falls more over to the rock side of things but still has a light touch that comes from a folk influence. That folk influence also comes from the inclusion of the cello from Sacia Jerome as it sounds like a fiddle in the track. The track ends up having a crossover feel that would be very welcome on today’s Top 40 radio formats as the song feels very commercial and very listener-friendly. Found continues with the track “Take You There”. The song kicks the energy of the music up as the band creates a quicker pace to the track. When the track begins, the band creates a strong musical feel that is built around the acoustic guitar, but the feel of the music changes for the refrain when the acoustic guitar is replaced with the electric guitar. The track alternates between the acoustic and electric directions throughout the three-minute play time. Like the first track of “Aligned,” “Take You There” feels very commercial and the listener will find much to like within the song. With the song “Release Me,” Well-Known Strangers slows things down. The easier feel at the beginning of the track comes from the keyboards and the cello. The track’s easy feeing helps to reinforce the lyrics about a restless mind that refuses to quiet down. As the listener allows the song to play out, they begin to identify with Betsy Ade as she sings. The song picks up halfway through the track and when it does, the more energetic feel of the song gives the lyrics a completely different meaning. Well-Known Strangers’ new release of Found comes to a close with the album’s title track, the song “Another Sun”. The track is probably the most commercial track and the closest thing to straight-out Rock And Roll of the four tracks on the release. The slow introduction at the beginning of the track builds until it “launches” into a strong folk-rock track that seems to combine elements of artists like The Indigo Girls and maybe even 10,000 Maniacs to create its musical feel. The song is very strong and could easily be the track of the four that make up the EP. 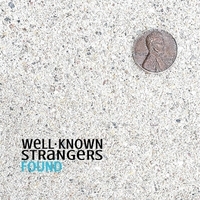 The Found EP from Well- Known Strangers is the type of release I love coming across. As the release plays out, the songs draw the listener further and further into the musical world of the band. With each note, you find yourself jamming along with the group and before you know it, the album comes to an end. The four tracks on Found are really strong and refreshing when compared to the rest of the current music that is being played on the radio. When the all-too-short release of Found from Well-known Strangers comes to an end, you will most certainly want more. To find the music of Well-Known Strangers, check out the band’s Soundcloud profile. Check out the band’s video to their song “Another Sun“. Thank you SO much Matheson for the fantastic review of our debut EP! We sincerely appreciate the incredible comments and time you took to listen to our efforts! We’re working on many new songs and prepping to play live in the future! Again, huge thanks.